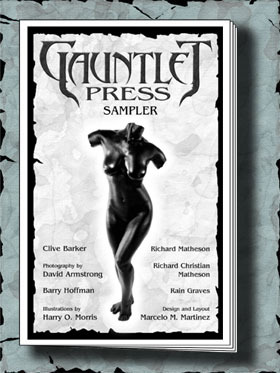 Just what is the Gauntlet Press Sampler? The Sampler is our way to introduce readers to Gauntlet Press. What is Gauntlet Press? What to we have to offer? The Sampler will be officially introduced at the 2001 World Fantasy Convention, with all attending having a copy in their welcome package. The idea was given to us by talented author Rain Graves and we jumped all over it. After all, Gauntlet has published the work of many talented authors. We want to make this unique collectible available to those who cannot attend WFC. 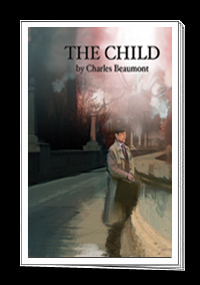 It includes unpublished short stories by Richard Matheson, Barry Hoffman and Rain Graves, a new poem by Clive Barker, accompanying the dazzling photography of David Armstrong, a Richard Christian Matheson story that first appeared in his short story collection DYSTOPIA, and the extraordinary artwork of Harry O. Morris (who has his official website at Gauntlet Press), all assembled by co-publisher Marcelo M. Martinez who lays out and designs all Gauntlet titles. The cover photo is another example of David Armstrong’s extraordinary photography. You can’t buy the Gauntlet Press Sampler in bookstores. It’s available only from Gauntlet Press for $9.99 + $2 p&h.